After dinner we headed up to Montmartre http://www.aparisguide.com/montmartre/index.html, which is quite close by foot. We had watched Le Fabuleux Destin d’Amélie Poulin http://www.imdb.com/title/tt0211915/ in class before our departure, so they thought it was fun to see Le Café des Deux Moulins, the café where Amélie works in the movie. Just after having a look (from the outside) at the café, we started our uphill trek to the stairs of Le Sacré Coeur http://www.sacre-coeur-montmartre.com/. Many people get to the top of the stairs and are so overcome by the panoramic view of Paris that they forget about the jewel of a Basilica that’s sitting right behind them. It’s absolutely worth going inside to have a look, even if you’ve been on a tour of Europe and you’ve seen so many churches that they’re all starting to look alike. Inside, you will find the enormous Byzantine mosaic of Christ. It’s one of the world’s largest. 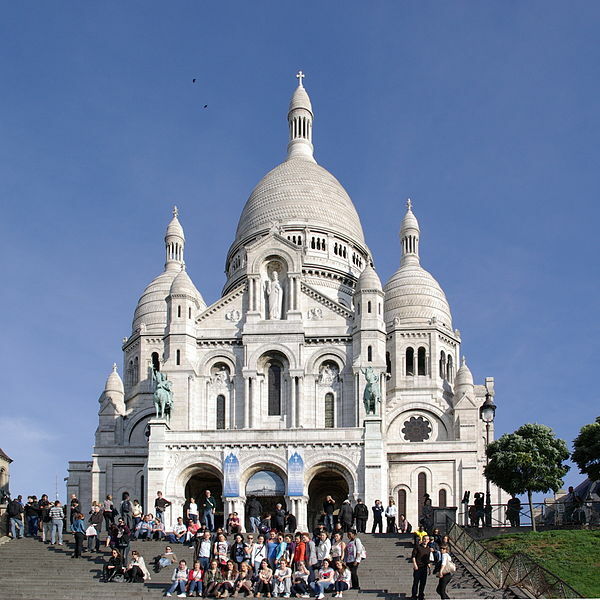 Many of my students were more impressed / inspired by Sacré Coeur than by Notre Dame de Paris http://www.notredamedeparis.fr/. You can’t take a trip up to Montmartre without exploring the Place du Tertre http://en.wikipedia.org/wiki/Place_du_Tertre. It’s normally filled with artists just waiting for a chance to draw your portrait. All of these artists are quite talented, or they wouldn’t have a spot in this world famous square. Portraits can be pricey, but it’s a nice gift for students to bring home to their parents or grandparents. For something a bit less dear, you can also have a caricature drawn, and that’s a lot of fun, too. And while you’re at it, don’t neglect the urge to grab a crêpe, but not just anywhere. 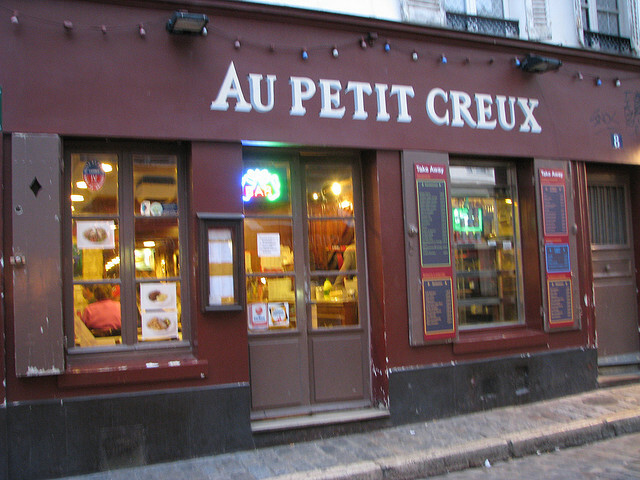 Get off of the Place du Tertre and walk down the Rue Mont Cenis and have one at the window of Au Petit Creux http://www.montmartre-guide.com/adherents/page3/i65/le-petit-creux.html. They’re not the absolute best crêpes in Paris, for that you’ll have to head over to Montparnasse http://www.davidlebovitz.com/2006/03/the-best-crpes/, but they’re still really good, especially with a big glob of Nutella inside. After filling up on crêpes we hopped back on the Métro at the Abbesses station, and headed back to our hotel. After such a full day, I didn’t have to worry too much about room checks. I think everyone fell asleep within 20 minutes. This is the last night we’ll be spending in Paris, for now. We’ll be back for a few more days at the end of the tour. Tomorrow morning, bright and early, we will make our way to the Gare de Lyon http://en.wikipedia.org/wiki/Paris-Gare_de_Lyon where we’ll board the TGV for a five to six hour ride to Nice. The final post for our trip to Paris will be Paris, Je t’aime (Part 6: Le Louvre, La Fête de la Musique). I hope you’re enjoying the blog, and merci.